"It was huge," said West Linn junior wide receiver Casey Tawa, who made two catches for 60 yards and ran 14 yards for a touchdown on his lone rush of the game. "What we emphasized all week was turnovers and starting fast on defense. We came out with a goal-line stand and got a turnover and that just led to more turnovers and we were pretty great on offense tonight so it was nice. It was a big win." "We expected them to be strong as a team, but we came out, we practiced our hearts out this week and we took it to them," said West Linn senior linebacker Brian MacClanathan, one of four different West Linn players to recover Tualatin fumbles on Friday night. "The results speak for themselves." With the win, the fifth-ranked Lions improved to 2-1 in Three Rivers League play — one game behind league-leading Lake Oswego — and 5-2 overall. No. 7 Tualatin, meanwhile, lost for the first time and fell to 1-1 in TRL play and 6-1 overall. After the game, the Wolves knew they'd squandered an important opportunity. "We kind of went out here and we beat ourselves," said Tualatin junior defensive back Luke Marion, who came through with a blocked punt on West Linn's first possession. "We didn't take advantage of the opportunities we had, and when opportunities presented themselves, we just … didn't grasp them. You can't have (five) turnovers and win a game. That's not how it goes." "We need to take care of the ball. That's on us. We beat ourselves," said Tualatin junior tight end/linebacker John Miller, who made two catches for 83 yards and one touchdown, and also recovered a West Linn fumble. "We gave most of our turnovers back and we couldn't execute on some of the plays we needed to … so that's on us." The two teams opened the night with a quick trade of turnovers, with Marion blocking an Ethan Long punt after the Timberwolves forced a three-and-out on West Linn's first possession, and Lion senior Max Jacobs recovering a Dominique Loggins fumble just two plays later. Then, starting from their own 3-yard line, the Lions marched 97 yards in nine plays to score the game's first touchdown, with Long scrambling 19 yards, Long hitting Tawa for 47 yards, and later, Long running 14 yards to the right flag to score with 7 minutes, 38 seconds remaining in the first quarter. While the Timberwolves forced three turnovers of their own, they managed just seven points off those extra chances, coming up empty after forcing a Cade Knutson fumble and seeing Cade McCarty recover late in the first quarter. The West Linn defense forced a three-and-out after that turnover, then drove 68 yards on its ensuing series to score again. Senior running back Dawson Jolley kicked that possession off with a 21-yard run, picked up another 22 after recovering a Long fumble and racing to the Tualatin 14, then scored one play later from the 2-yard line to give the Lions a 14-0 lead at the start of the second quarter. After another quick Tualatin punt — West Linn forced another three-and-out highlighted by junior defensive end Damiko Tidmore's tackle for a loss — the Lions made it 21-0 when Long hit senior wide receiver Cade Knutson at the left flag for a 13-yard score. Long had a 44-yard scramble and Jolley a 15-yard burst earlier on the drive. The Wolves rallied there, however, starting their next possession with a long kickoff return by senior Jake Anderson to the Lions' 45-yard line. From there, senior Kyle Dernedde hit junior Caden Dickson for 16 yards, and later, hit Dickson again over the middle for 23 yards and a score that brought their team within 21-7 with 6:48 to go in the half. The Lions answered with an 80-yard scoring march that saw Long complete six of seven passes — including two to senior wide receiver Tanner Moore for 37 yards — and ended with Long's 1-yard run off left tackle for the score and a 28-7 lead with 1:15 to go in the opening half. "When you have receivers like (Cade Knutson and Casey Tawa) who just constantly burn DBs, it's like 'Here we go. Maybe now it's my turn,'" said Moore, who had six catches for 54 yards and also recovered one Tualatin fumble. The Lions and Wolves started the second half with another quick trade of turnovers, with MacClanathan recovering a Dernedde fumble at the West Linn 17, and four plays later, Miller picking off a Long pass and taking it back 23 yards to score and cut the Tualatin deficit to 28-14 with 6:03 to go in the third quarter. The Lions responded impressively, though, piecing together an 80-yard drive that took 19 plays, ran 6:10 off the clock and ended when senior kicker Abdul Ali — who also went 5 for 5 on extra points — connected on a 31-yard field goal to give West Linn a 31-14 lead with 11:47 left in the contest. Tualatin turned the ball over on its next offensive play — a Loggins fumble at the end of a 35-yard run recovered by Moore at the West Linn 19. But this time it was West Linn that failed to take advantage, with Long fumbling the ball away to Miller at the Lions' 25. The Wolves, however, wasted that chance — Jolley picked off a Dernedde pass two plays later at the Lions' 15 — and their next one when Dernedde fumbled the ball away to West Linn sophomore linebacker Cole Peters near midfield midway through the fourth quarter. Seven plays later, Tawa took an end around left and sped 14 yards to score and give his team a 38-14 lead with 4:57 left in the game. The Wolves cut that deficit to 38-20 when junior Blake Jackson hit Miller for a 68-yard score 56 seconds later, but West Linn sealed its win with a 58-yard TD march for the night's final score, a 9-yard burst up the middle by junior running back Kobe Ritter with 1:39 left. "Whoever wins the turnover battle wins the game, and we won the game because we won the turnover battle," Tawa said. "It's a huge win because after we lost to (Lake Oswego), if we lose this one too, then we're rolling in a bad direction. Beating a 6-0 team at home convincingly the way we did, that's huge." "Max Jacobs and Cole Peters and everyone on the defensive line, they're just ballhawks," Moore said. "They go for the ball and it works every time." For their part, the Wolves vowed to learn from the loss and come back better next week. "I think we need to come together more as a team and have a better week of practice," Marion said. "We've just got to flush all the mistakes and move on to the next one, get on the practice field and do the best we can for next week." "We need to go back to the lab, back to the chalkboard, learn what we did wrong and get back to it next week," Miller added. For the game, Long completed 32 of 47 passes for 351 yards and one touchdown with one interception, Jolley carried 18 times for 99 yards, Knutson had 11 catches for 130 yards and senior Brodie Corrigan caught five passes for 67 yards. For Tualatin, Loggins carried 15 times for 86 yards, Jackson went 2 for 4 passing for 68 yards and one TD, Dernedde was 4 for 7 for 64 yards, one TD and one interception, and Miller caught two passes for 83 yards. 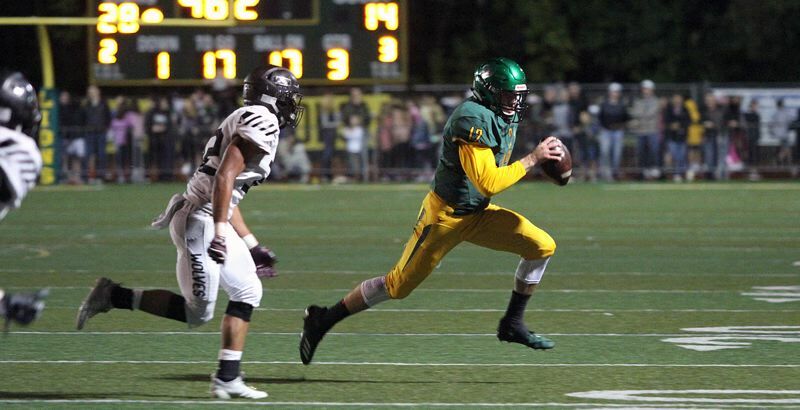 Next up, West Linn hosts Tigard at 7 p.m. Friday, while Tualatin hosts Lake Oswego at 7 p.m.